We're spending this week on The 80s Cruise, a party-hearty flashback to the decade where neon was cool, excess was awesome and the music was un-freaking-believable. 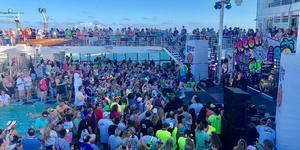 The annual weeklong themed charter -- held this year on Celebrity Infinity but heading to Royal Caribbean's Explorer of the Seas in 2020 -- aims to be the perfect Spring Break for the Gen X set -- and from what we've seen so far, it's right on point. Sixteen musical acts and personalities are on this year's cruise -- and the 2020 lineup will have more than 20, including chart-toppers like the B52s and Bananarama. The organizers have gone out of their way to include different genres; the '80s encompasses a wide range of musical tastes, after all. In the same night, you can see Starship, Cutting Crew and English Beat -- and that's not including the almost daily pool party performances by the outstanding '80s cover band, Jessie's Girl (who play all your favorites, in '80s costumes). 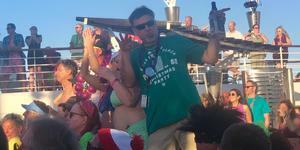 Most people come on The 80s Cruise for the first time because one of their favorite bands is playing, we're told -- and then they have such a good time, they keep coming back. 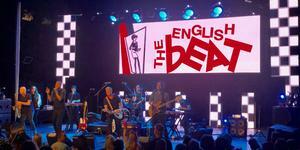 The '80s soundtrack isn't limited to the concerts. 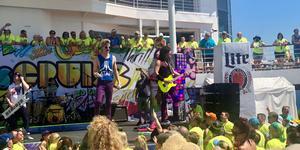 Sirius XM is a sponsor, and the Eighties on Eight blast all over the ship. It's fun to come into the buffet and hear a boppy song like "Walking on Sunshine," or watch the dueling piano players break out into "Blister in the Sun." Karaoke draws a big crowd, and DJ sessions take place during concert lulls. (For those who need a break, the Solarium pool is a refuge, as is your cabin). 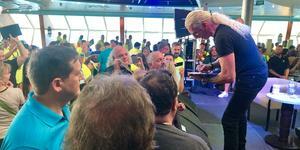 As cruise host Dee Snider (of the '80s metal band Twisted Sister) yelled out on the first day, the passengers on The 80s Cruise are committed. 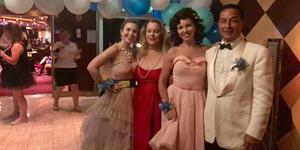 They come ready to party, and are all about making the experience retro. Newbies are considered "freshmen," and members of each class identify themselves with slap bracelets, T-shirts and colored Mardi Gras beads. Don't worry, there's no hazing, aside from a joke or two that freshmen need to buy the drinks (and that's all in good fun). The theme might be high school, but fortunately, we're all grown up. While passengers who have cruised before tend to hang out, they are very welcoming to the newcomers; we feel like we're constantly high fiving. It's like being at the weekend keg party that you've actually been invited to (as opposed to hearing about later in homeroom). The friendliness onboard is heavily lubricated with alcohol; almost everyone has a drink package, and the next 80s Cruise on Royal Caribbean will be all-inclusive. Most passengers are in it to win it, drink-wise. While you don't have to drink to have a good time on this cruise, you'll be around a lot of partiers, particularly at the pool. Most people seem to be handling their liquor responsibly (well, most -- we've been concerned about a few). And we're impressed that even with all the alcohol being consumed, everyone still knows all the words to literally every song. 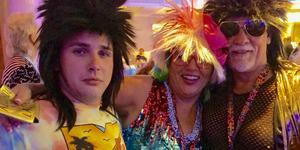 Six out of the seven nights on our weeklong cruise are themed, and people take them seriously. Many people brought multiple suitcases for their outfits, which range from frilly, over-poufed dresses for Prom Night to full replicas from videos. We've seen people dressed as A-Ha, Eddie Van Halen, Madonna in various incarnations and the Donkey from Donkey Kong. Even people who aren't into full costumes and wigs channel the theme with concert and MTV T-shirts or neon leggings. With all the drinking going on -- not to mention the swearing; the F bomb is a constant -- The 80s Cruise is a decidedly adult atmosphere. Kids Clubs onboard have been transformed into headquarters for production staff, and the only children we've seen have been with the ship's officers. Many parents (and a few grandparents) seem to be treating themselves to a kid-free Spring Break, looking younger, it seems, with every dance party. 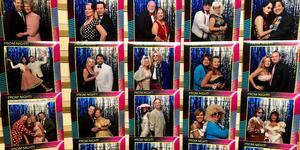 As the cruise director told us during sailaway, The 80s Cruise is different than your typical cruise. There's no formal night, dress code or assigned dining (most people seem pretty happy grabbing slices from the buffet). The focus on music, theme nights and fun '80s events makes spots that are usually happening on a regular Celebrity cruise, such as the specialty dining venues and casinos, dead zones. 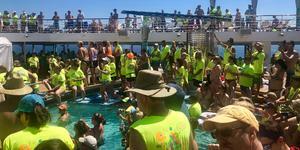 We've been on a lot of cruises, and we've seen nothing to rival the sheer party atmosphere of the pool deck when a concert begins. Beach balls fly, people climb lounge chairs, ET puppets show up. Want to drunk-dance wildly in the pool? Done. Want to bust a move and garner a crowd? You can (although we've been a bit worried someone will break a hip). OK, it's not all drinking. There's some education going on, too, if MTV is your favorite subject (it was for us, back in the day). 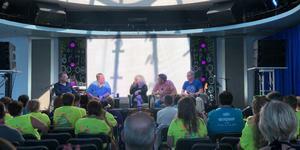 During the day, the original MTV VJs host interviews and Q&As with the musicians and bands. Who knew that Mark Goodman and Alan Hunter once hated each other, or that Dee Snider has had such an interesting and varied career since his hair band days? (Mark Goodman, by the way, is perhaps the best interviewer we've ever seen in action.) For music fans/pop culture geeks, this insider access is really fun and exciting -- and a nice respite from the non-stop action outside. The 80s Cruise makes events, such as wine tasting with Berlin lead singer Terri Nunn or dolphin swim with Tiffany, available for an extra fee. But you can see the musicians hanging around the ship, too. Many veteran cruisers bring album covers or T-shirts for artists like The Fixx to autograph. Of the acts playing, only Kenny Loggins opted to just fly in for a concert in Cozumel and leave. The cruise organizers tell musicians that the more available they make themselves, the more the fans will leave them alone. From what we've observed, that's mostly true. Nightlife goes until you drop. The bar scene literally closes when the last person leaves (or crawls back to their cabin, as we heard one cruiser did). 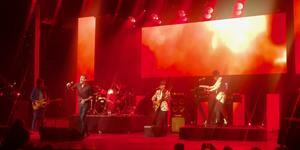 Somehow, even the middle-aged gain more stamina, a factor that has to be attributed to the overall vibe. After a full sea day that began at 10:30 a.m. with '80s trivia, we weren't sure we'd make it to the special 1 a.m. Dark Wave dance session with DJ Christopher J (Christopher Olivas, who doubles as a drummer for the new-wave band Berlin). Somehow, the sheer awesomeness of the music we loved -- New Order, Siouxsie & the Banshees, Talk Talk -- got us through… even without a nap. The next 80s Cruise takes place March 8 to 15, 2020, as an all-inclusive sailing on Explorer of the Seas. Bands announced so far include the B-52s; Berlin; Patty Smyth of Scandal; Tony Hadley of Spandau Ballet; Tony Lewis of The Outfield; Asia; Big Country; the Motels; Lita Ford; Bow Wow Wow and more. 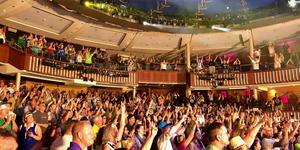 Go to The80scruise.com and check out the 80's Cruise Lineup (Booking opens March 12th) for more information.